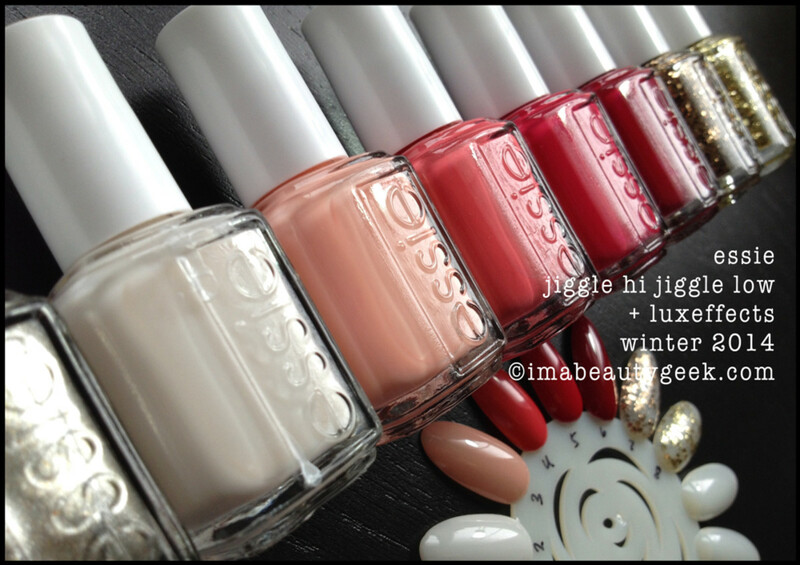 Essie Winter 2014 is sort of a surprise collection. Don’t get me wrong, it’s not like a winter collection is surprising, it’s the shade assemblage. Maybe it’s just me but hey, let’s both take a look and then I cordially invite you to share your thoughts with me and with our fellow readers. essie winter: spirited holiday color? Okay, so yes, Essie is calling this collection Jiggle Hi Jiggle Low and I just don’t get it. What’s in a name? Apparently confusion. I see half a winter collection and then the other half loses me somewhere around Resort and Summer. 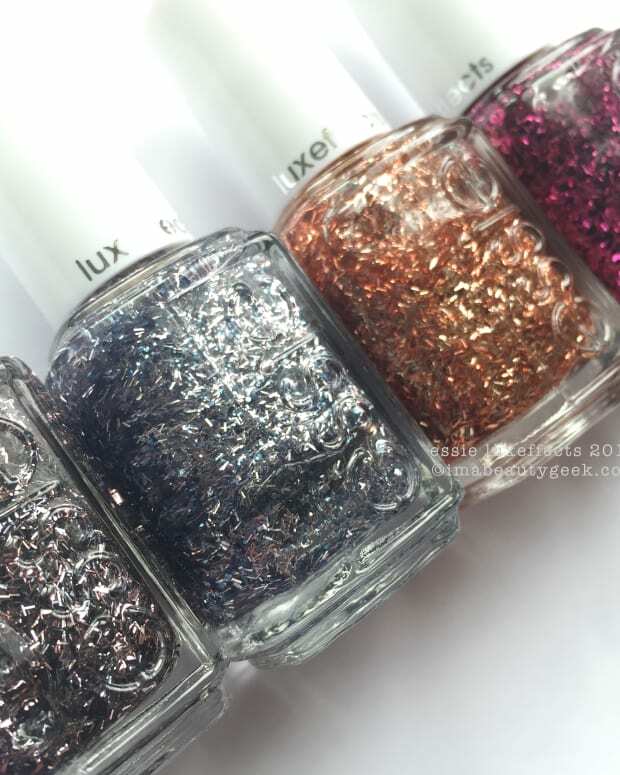 But there are 2 new Luxeffects shades for 2014 launching at the same time – those might maybe help you take those unlikely winter shades and make them a little more festive for let’s say... holiday? 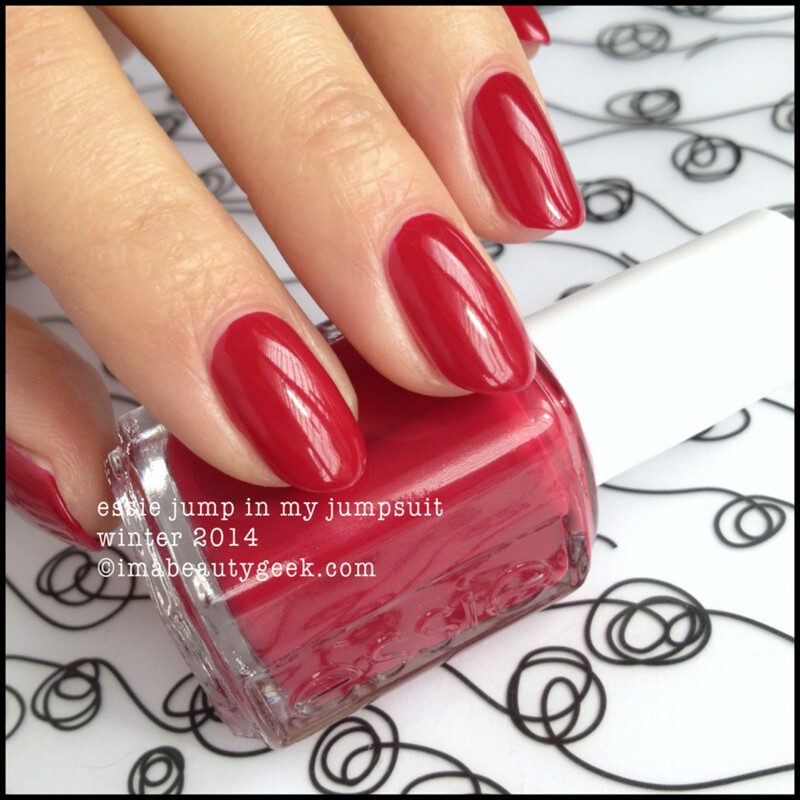 above: essie winter 2014 tuck it in my tux. Here in this shot, the sheer-ish creamy white Tuck It In My Tux looks pretty okay. If you make zoomy-zoom, you’ll see visible nail lines, a big fat cuticle gap, a not-so-great level, and decidedly uneven coverage. That’s three solid coats. Three. Me and this formula didn’t get along. Nope. 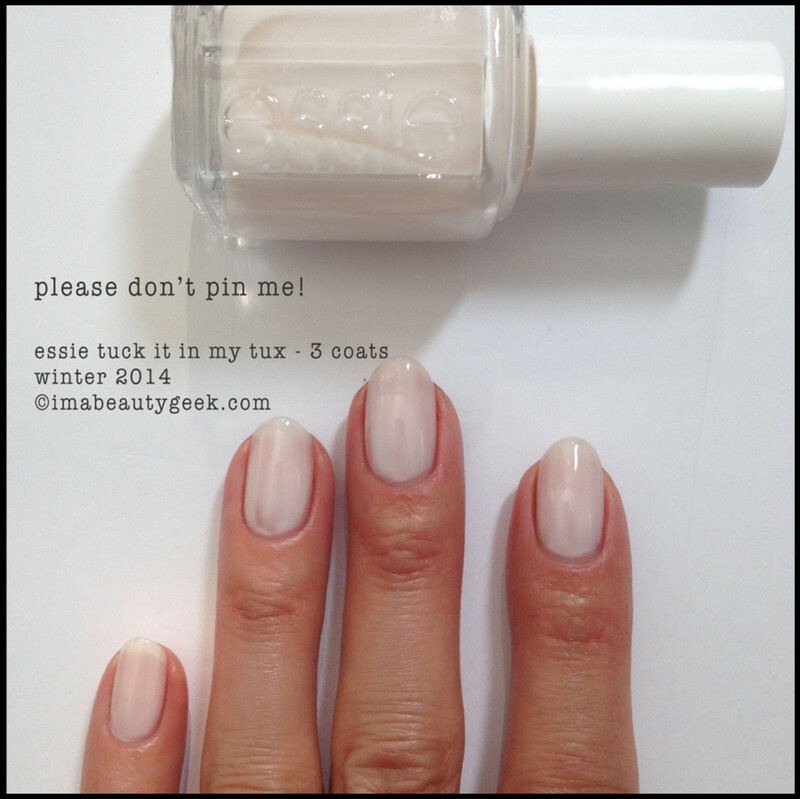 above: essie winter 2014 tuck it in my tux. I always start swatching a collection with white. I have two reasons for that. First, it doesn’t stain my cuticles so I can remove it and keep swatching without having to scrub to get the stain out. Second, many shades of white are notoriously difficult to apply perfectly, so I start with the hard stuff first. Oh, hey! What you see there is the exact same polish job as the first image. For three good coats, I call that a fail. 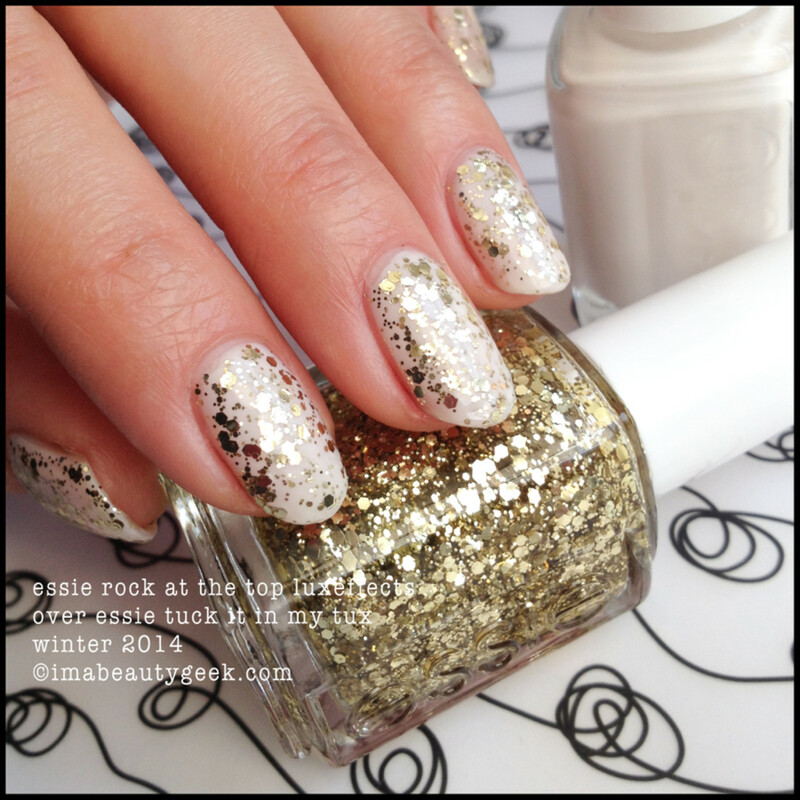 above: essie winter 2014 rock at the top luxeffects over tuck it in my tux. But lookit what happens if you slap a single coat of yellow-gold Rock At The Top Luxeffects over that marshmallow white! It’s all kinds of winter holiday! Yay! And as a bonus, it covers up all the imperfections – kinda like spackle. Pretty, glittery, golden spackle. above: essie set in stones (luxeffects 2011) over essie tuck it in my tux. And if you whip out one of your older Luxeffects shades and slap that over your new winter white, you get a perfectly frosty, glacial-esque manicure. I dig this combo. It’s chilly. 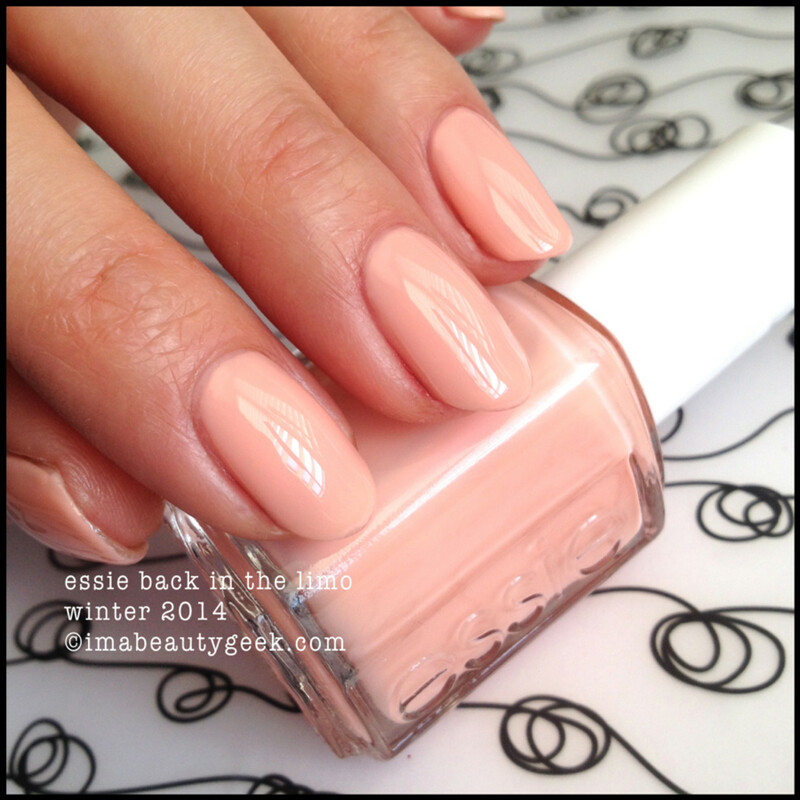 above: essie winter 2014 back in the limo. This formula was the same sheer stuff as Tuck It In My Tux and it’s not my kinda polish. I find it difficult to work with this consistency with this brush – I just don’t get the kind of control I like. Maybe you&apos;ll do better? I will tell you that I blobbed on three thick coats to get to what you see in the picture. It wasn’t the prettiest technique but I somehow managed (&apos;cept for that cuticle gap on my index finger) to get the coverage I was lookin’ for. 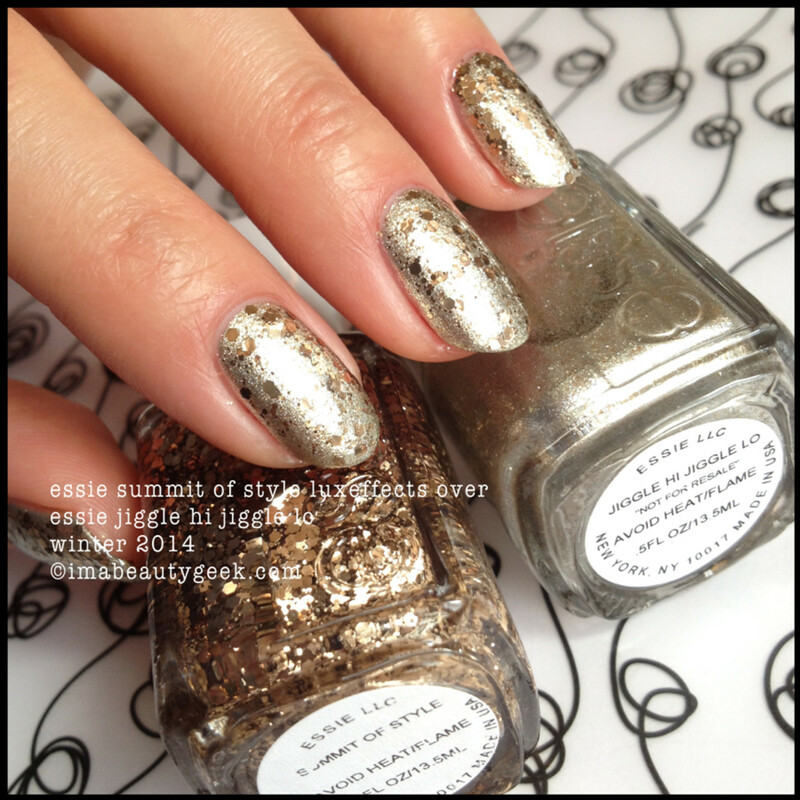 above: essie winter 2014 summit of style luxeffects over back in the limo. And here’s the second of the new 2014 Luxeffects. It’s a bronzey-gold (or rose gold if you prefer to call it that) version of Rock at the Top. Groundbreaking? Nope. Glittery? Yes. That’s one coat by the way – load your brush, pull it out, slap it down and even it out. The stuff goes on pretty good! 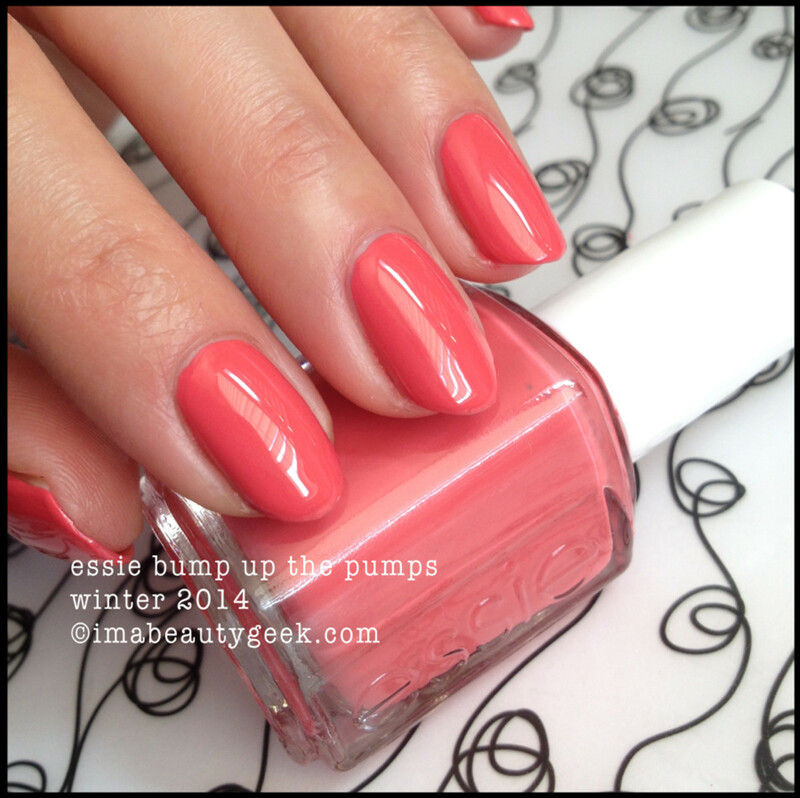 above: essie winter 2014 bump up the pumps. Huh. I got nuthin’ on this so let’s see what Essie has to say… “Step out in this raucous coral mauve that will keep you warm all season.” Like, what? But the formula is good! It’s even great! And the colour is great too! For spring. Or maybe summer. BTW, raucous is a synonym for discordant so yeah – it’s right on. 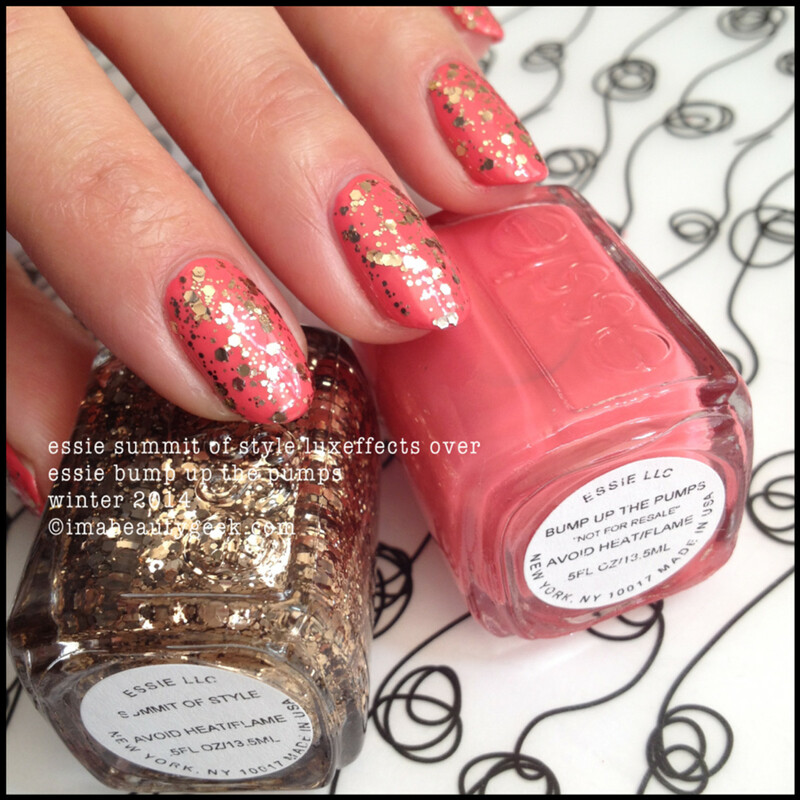 above: essie winter 2014 summit of style luxeffects over bump up the pumps. But then if you put a single coat of the Summit of Style Luxeffects over your not-wintery shade of rose-coral, it reigns in that summery shade and brings it back to holiday. Clever use of glitter, yes? 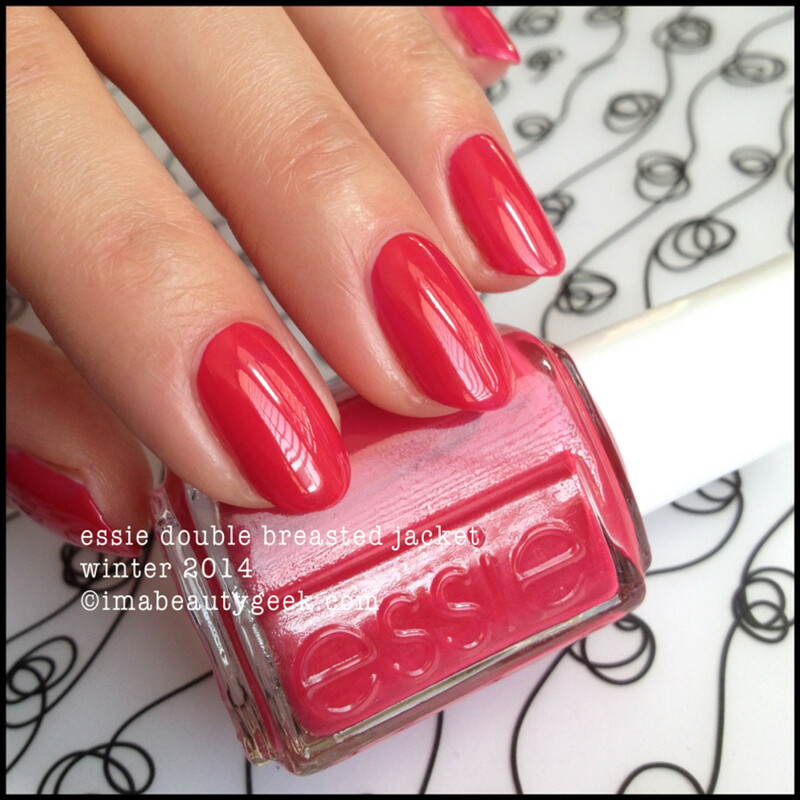 above: essie winter 2014 double breasted jacket. Oooh! Another winning formula! This is the kind of stuff I love to see from Essie. Good polish in a great shade that’s a genius formula all packed in a bottle with a brush that works stupendously well. It’s a OCW!!! A bright, strawberry-crème red of a shade that makes me wish I knew what it was doing in a winter collection. 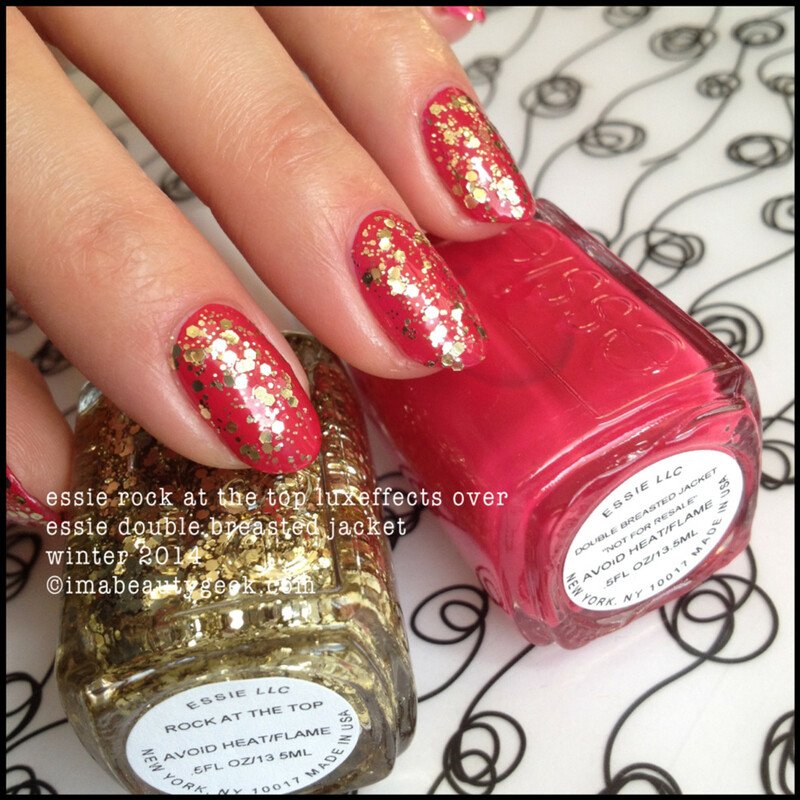 above: essie winter 2014 rock at the top luxeffects over double breasted jacket. Again, if you go ahead and add a single coat of that bright yellow-gold glitter Luxeffects, it’s all kinds of holiday. Winter and holiday are the same, right? 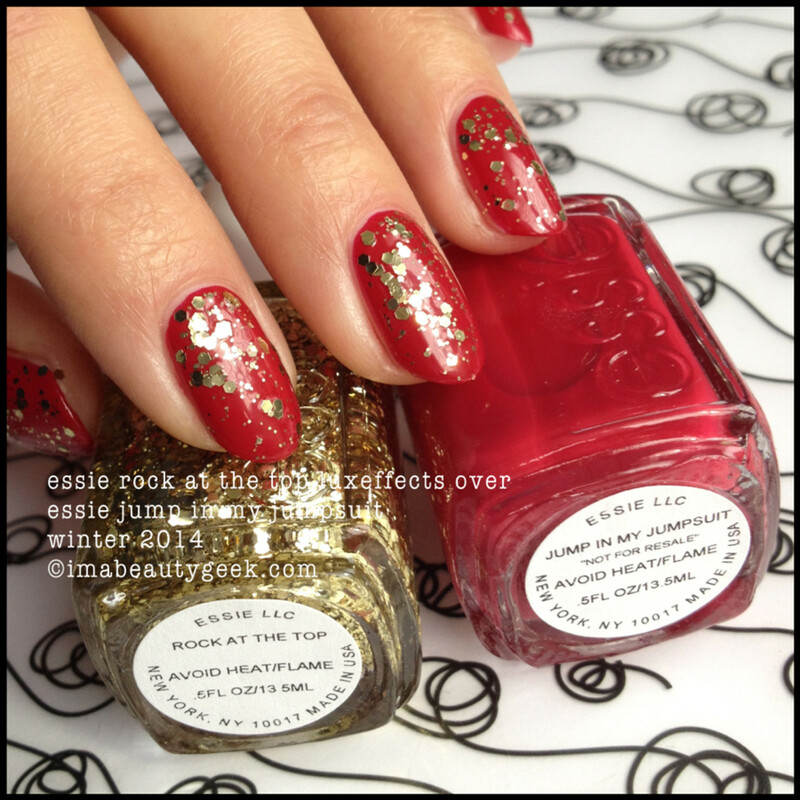 above: essie winter 2014 rock at the top luxeffects over jump in my jumpsuit. One more time for Luxeffects bringin’ holiday back! Do this because you can. Do it because it’s bang on target for winter and holiday. 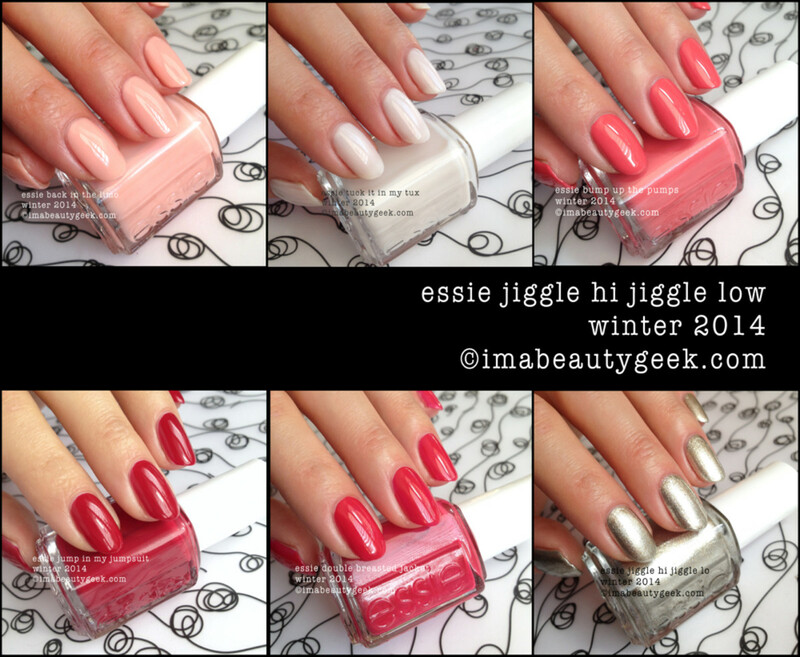 above: essie winter 2014 jiggle hi jiggle low. Yes, I’ve watermarked my images to say jiggle lo – no w ‘cause on my label, there’s no w. All the press materials have a w on ‘em but seeing as my label says lo and not low, I rolled sans w. As for the polish itself, I dig it. I like this shiny silvery white-gold confection. I like that it’s not streaky, I like that the gold crosses its boundry and walks around in silver territory like it owns the place. That’s two easy coats and it’s shine-tastical. 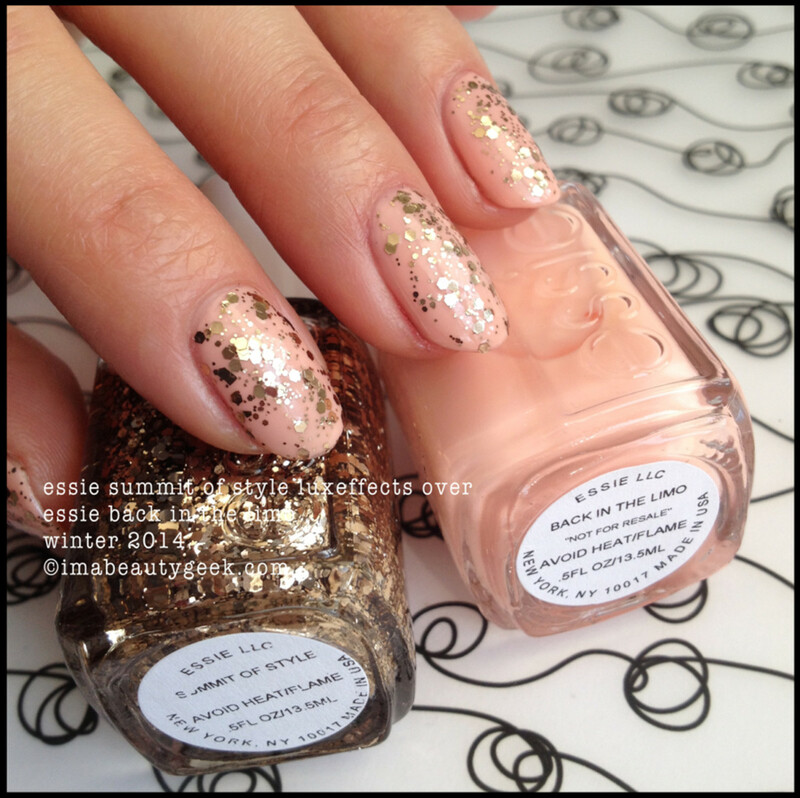 above: essie winter 2014 summit of style luxeffects over jiggle hi jiggle lo(w). And if you wanna get all kinds of special, how about this? Do it. It’s awesomesauce. Wow, how’s that for an all-over-the-place kind of winter collection, huh? I know you have thoughts. You know I wanna hear ‘em! 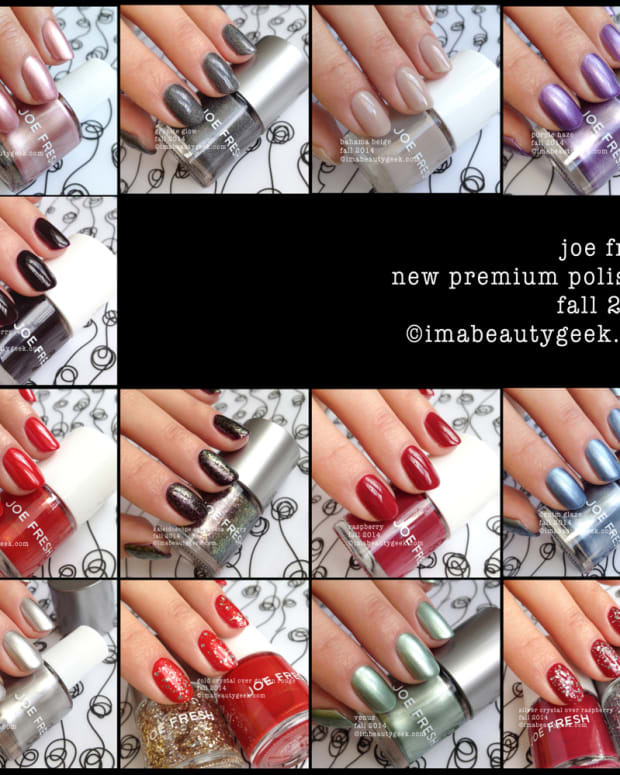 This Essie Winter 2014 Collection and the two 2014 Luxeffects shades should be available all over the place as of November 2014 but some sellers in the US already have &apos;em on-counter (San Jose and Massachusetts thus far, so keep your eyes peeled). For more Essie information than you can shake a stick at, visit Essie.com. 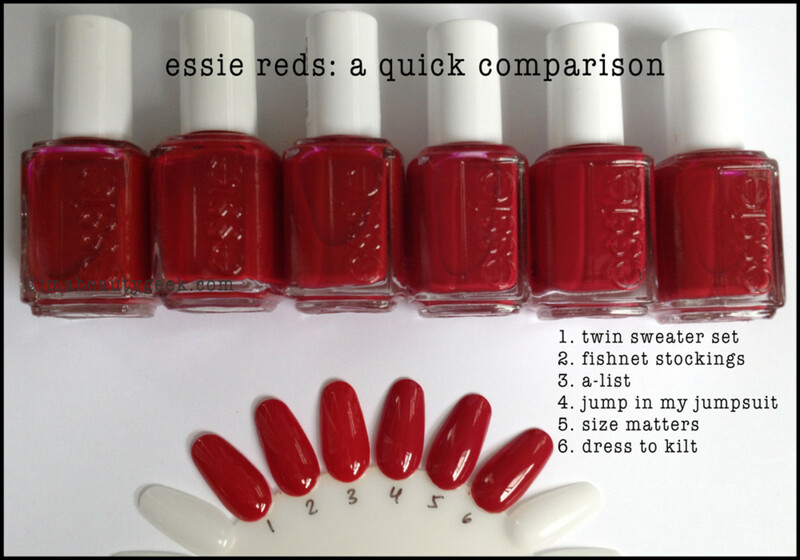 For the current Essie 2014 Fall collection that&apos;s on-counter now, visit our Essie Dress To Kilt swatch post. 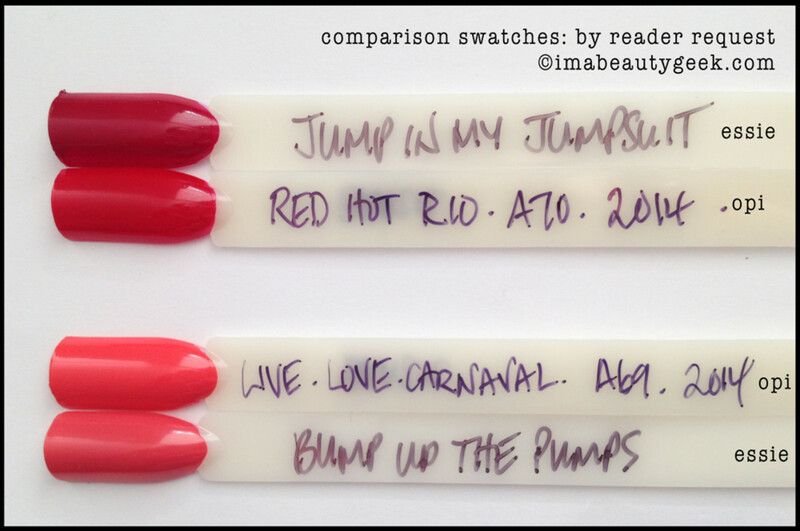 *above: essie jump in my jumpsuit comparison swatch wheel: for Kimberly and everyone else who is wondering exactly the same thing. 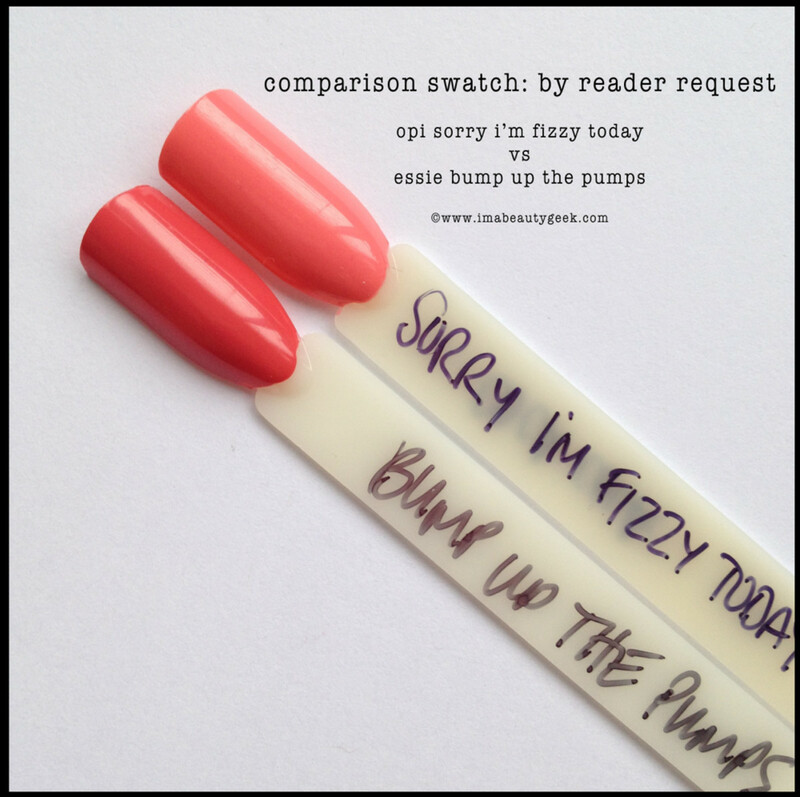 Comparison Swatch: OPI Sorry I&apos;m Fizzy Today vs Bump Up The Pumps - by reader request. 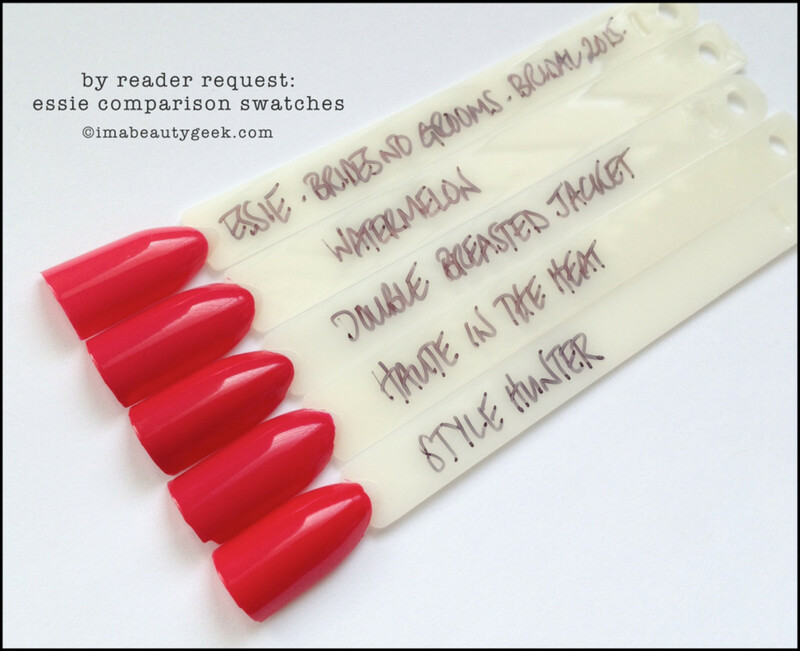 Yep, another comparison swatch - it&apos;s how we do here at Beautygeeks!